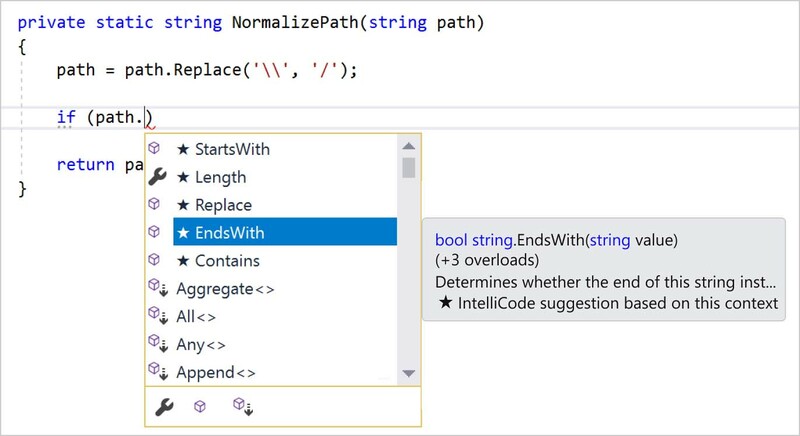 Microsoft today announced IntelliCode, a new experimental developer tool for Visual Studio users that brings more of the company’s artificial intelligence smarts to software development. With IntelliSense, Visual Studio has long featured a smart code completion feature that makes writing code faster and less error-prone. With IntelliCode, Microsoft is going a step further. This new feature intelligently suggests the next API for a developer to use, for example, instead of simply providing an alphabetical list of code-completion suggestions. It’s basically the next generation of IntelliSense. For now, this feature is only available for C# code in Visual Studio 2017. Over time, Microsoft plans to expand support to other languages, as well. Since the feature is still experimental, it’s not quite ready for developers yet. You can sign up for the upcoming private preview here, though. Microsoft tells me that the feature works by understanding the context of the code you are currently working on. Thanks to a machine learning model that has been trained by looking at lots of code, the tool can understand what you’re trying to achieve and then (hopefully) make the right suggestions based on the context and patterns in your own code.